Due to no official eGPU support in Bootcamp, TB3 Macs have experienced very spotty successes with setting up, using, and updating eGPU enclosure firmware. Throw in the mix of issues is the lack of Intel Thunderbolt Software for Apple computers. We essentially need to scavenge other manufactures' support portals to download this piece of software. I'm using the AORUS GTX 1070 Gaming Box for this guide as the H2D firmware update was recently released. This firmware flashing procedure was done with a mid-2016 15" MBP. I tried nearly a dozen different Intel Thunderbolt Software and they all don't fully work in Bootcamp. The good news I found is that we don't really need a functional Intel Thunderbolt Software in order to use an eGPU and update its firmware. The TB3 15" MacBook Pro may be the best performance eGPU host but it's also a huge pain in the behind to set up and update the enclosure firmware. It's almost a love-hate relationship at this point for me with this laptop. Hopefully, by documenting my success through trial and error you don't have to go through the same issues I encountered. If you happen to be an Apple engineer or support staff reading this guide, please improve the firmware for these TB3 Macs so that they "just work" in Bootcamp. Intel Thunderbolt Software version 16.2.55.275 is the one to use. This was meant to be used on a NUC Kit NUC6i7KYK. The installation completes successfully but the software itself won't run because it detects Bootcamp and says no-go. Below is the screen capture you'll see. Ignore it as the presence of Intel Thunderbolt Software version 16.2 in Windows is good enough for the Firmware Update Tool to run. The message itself is rather oxymoron. Each manufacturer releases its Thunderbolt 3 enclosure firmware update with a flashing tool. I don't recommend mix-and-match because it may brick your Thunderbolt device. For AORUS Gaming Box firmware, visit Gigabyte support website. We also keep eGPU.io Buyers Guide up-to-date with links to firmware releases. Once you have both Intel Thunderbolt Software and Thunderbolt firmware update, it's time for the fun part. There are three main hurdles to overcome before you can click button to start the firmware flashing process. Hurdle #1 - Thunderbolt FW Update Tool checks for the existence of Intel Thunderbolt Software before it can launch. Version 15.x and newer will get you through this. Hurdle #2 - The second step is to locate the Thunderbolt device before Thunderbolt FW Update Tool can proceed. If you don't see your enclosure at this screen, it's because your eGPU is working great in Bootcamp. Wait, what?!! How is this making any sense?... In order to update the eGPU enclosure firmware, the eGPU functionality must not be running. You have two choices: either remove the GPU from the enclosure physically or hot-unplug then hot-plug to yellow-bang the eGPU. I know this paragraph reads like a bad joke but due to software glitches and unsupported devices, this is how I got it to work. Once you see your enclosure at Select Controller/Device click to select the Thunderbolt device under Port number. Hurdle #3 - At Select FW Image click the Browse button and select the .bin firmware file. Unless you have Intel Thunderbolt Software version 16.2.55.275 installed, it will throw an error when you click the Next button. If you manage to see this screen, it's going to work. Simply click the huge Start Thunderbolt™ firmware update button to flash the new firmware. When the progress bar gets to around 90%, the enclosure typically power cycles itself for the new firmware to complete its updating process. Don't freak out if you see the LEDs on the AORUS Gaming Box turn off. Once you see this screen, it's safe to close the Thunderbolt FW Update Tool then restart the computer. This procedure may be unique to the Thunderbolt 3 15" MacBook Pro. If you have the 13" MBP you probably won't encounter hurdle #2. Give it a try and let us know how it goes. Feedback are welcome to improve this guide. I really can't thank you enough. Almost a week I tried to update the gaming box without any success. Who could've imagined I needed to take it apart for the update to work... Again without your continenous help and guidance I think allot of people wouldn't get this far. Just as a small token of appreciation I made a small donation to Rastafabi. Keep up the amazing work. @David Daniel Thank you for the donation to Rastafabi. I'm glad to hear you're able to flash the firmware. It was really a confusing process for me too. I spent more than 3 hours going over different Intel Thunderbolt Software versions and connection methods. One interesting tidbit from trying Intel Thunderbolt Software version 17.1.64.250 is external GPU supported: Yes on this late-2016 15" MacBook Pro. I did not see this in older versions. Can I get some clarification as to what "hot-unplug then hot-plug to yellow-bang" means, and how difficult this is to do? I've sadly had to re-install my Boot Camp partition 5 or 6 times through the process of getting the box to work stably (most recently, I had to re-install Windows because I cannot get rEFInd to actually install properly and last night it just decided not to run when I restarted Windows, leaving me unable to get past the Windows boot up screen. So now every time I shut down my Windows partition I need to enable PCI x16 and go to the mac side to run the rEFInd installation script to make sure it will be my boot loader [if you have any tips on getting rEFInd to consistently be my boot loader that would be a huge time saver]). Anyway, I don't feel comfortable actually removing the GPU from the enclosure as I don't want to risk any damage / having to re-install Windows for the upteenth time, but I can't find anywhere what hot unplug, hot plug, and yellow bang means. Also sincere thanks to everything you've done, without you I'd essentially have a very expensive paper weight. I have a 2017 MBP running great on Bootcamp with a Mantiz Venus + 1080ti. Are there any reasons I should change the Thunderbolt 3 drivers? @Keegan Shay Hot-unplug then hot-plug is to disconnect then connect the eGPU enclosure while the MacBook Pro is running in Windows. Doing this will make the enclosure communicate to Windows but eGPU non-functional due to error 31 or error 12. You can see the yellow triangle with exclamation mark on the eGPU in Device Manager. Some of us refer to getting this error as yellow-bang. If rEFInd is not reliable for you, I'd suggest following Goalque's instructions to use apple_os_set.efi on a USB stick. Then hold OPTION key at boot to select your startup volume. Did you disable SIP prior to installing rEFInd? Hey, I've got a late 2015 rMBP (m370x) running Bootcamp which I'm using with the Aorus Gaming Box via a TB3 to TB2 converter. 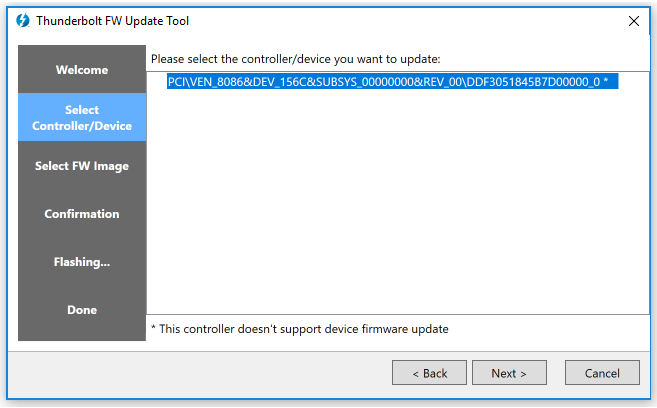 When I try to update the firmware it shows the 'PCI\VEN_8086', but it doesn't show the 1070 below it. It also says 'This controller doesn't support device firmware update'. In the footer. But nothing seems to work. I have another issue that may or may not be related? I have the Aorus Graphics Engine installed, but it fails to acknowledge the Gaming Box. I also suspect that I may not be able to update the Gaming box because it is a TB3 device and I've got a TB2 laptop? Other than the issue with this update, the engine not acknowledging the Gaming box and some random freezes, everything else seems to run decently and I'm sure the box is working. It is also displayed in my device manager. That is correct. All Thunderbolt 3 enclosures have required a native Thunderbolt 3 host to perform the firmware update. You may want to confirm using CUDA-Z that you are already getting matching 16Gbps-TB2 bandwidth. In which case there is questionable value in upgrading to the H2D fixed firmware. Yeah SIP is disabled, I've come up with a few steps to make sure I don't run into any rEFInd problems in the future (I pretty much just turn of PCI x16 and boot into macos every time I'm going to be away from my laptop for a few hours, ensuring that I won't get stuck booting into windows without rEFInd again, since I can re-enable the program from the mac side [I also made a USB boot manager with that guide just in case]). Thanks for the info, I'm still stuck on hurdle #1 though, I installed the 16.2.55.275 Thunderbolt software, but I'm still only getting the "No active Thunderbolt (TM) controller found in the system or thunderbolt (TM) software is not present in the system" error when I run the FwUpdateTool, any ideas? What is the benefit of this Guide? Is it that at the end of it, my eGPU (Aorus Gaming Box) will work plug and play without any need of the other workarrounds described in this forum, or is it "just" for Firmware upgrade in order to fix the H2D issue and I still need the workarrounds to initial setup my eGPU in Bootcamp? Good question. I finally got my Aorus box working in windows via bootcamp and loathe to do anything else to change it now! @GiGi85, theitsage's guide here is purely an explanation of how to upgrade your TB3 enclosure's firmware when attached to your TB3 Macbook under Windows. The upgraded firmware may fix the H2D performance issue or sometimes eGPU detection problems. We don't need Intel Thunderbolt Software in order to use eGPU in Bootcamp. It's only needed for firmware flashing of the TB3 enclosure. Uninstall Intel Thunderbolt Software, restart the computer then install 16.2.55.275. Also tried to re-boot with the GPU removed from encloser, still having Hurdle #2 with the Port not listed. Also clean uninstalled drivers and re-installed again, no effect. @GiGi85, it was helpful to have the video of your attempt. My first recommendation is to be patient through the process. Try one thing at a time and don't remove the GPU when the power was running like that. The LEDs' behavior during boot up are normal and eGPU should work. When Windows finishes loading up, you can run Intel Thunderbolt Software then close out the error message. Proceed to hot-unplug then hot-plug after about 15 seconds. Now run the FW Update Tool by right-click > Run as Administrator. If that doesn't help with the firmware update, you can remove the GPU completely out of the enclosure when it was off. Boot into Windows with the enclosure attached. Open Intel Thunderbolt Software and close the error message. Open the FW Update Tool by right-click > Run as Administrator. wow, it finally worked, it was indeed because of my impatience 🙂 had to wait after Windows booted and after hot unplug a few seconds. Can`t thank you enough @theitsage! So, Upgrade went through smoothly. Do These values seem ok? I saw some higher values in this Forum, but difficult to compare since configurations are diffrent. When Windows finishes loading up, you can run Intel Thunderbolt Software then close out the error message. Proceed to hot-unplug then hot-plug after about 15 seconds. Now run the FW Update Tool by right-click > Run as Administrator. I've followed this a couple times but I still can't get the enclosure to show up in the Thunderbolt software. Is there any trick to it or just keep trying until it works? edit 2: My girlfriend has a 13" MBP with touchbar, which does not have a dGPU. I'm going to try to install the firmware update on that this weekend, as I'm led to believe that the firmware update, once installed, will stay installed when I plug it back into my 15" MBP. I'll update with another edit once I've tried. The link for the Intel software update doesn't work anymore. This same Thunderbolt 3 firmware flashing procedure is confirmed to work with a Mantiz Venus [link]. I can't get by hurdle one with a late 2013 mbp thunderbolt 2 (venus)... I have installed 16.2.55.275. In device manager I have a device in device manager called: Thunderbolt(TM) Controller -156C. In its properties, it says 16.2.55.1 strangely. I get the "application can not run in boot camp" when I run thunderbolt software from start menu. I took the video card out and only have my SSD remaining in the Venus. When I run Venus firmware update, I get : There is no TBX-550CA_NOMOD in the system or Thunderbolt(TM) software is not available message. Has anyone with TB2 got this firmware to run? sorry, I don't have TB2 MBP here...Also want to know about the result. @Mike and @Mymantiz_John, Thunderbolt 3 enclosure firmware update can only be done with a Thunderbolt 3 computer. It's not possible with Thunderbolt 1 and Thunderbolt 2 computers. @theitsage, thank you for the info, you saved me a ton of time as I was just settling in to have another go at it. Although obviously this is very disappointing. One of the reasons for buying this thing in the first place was to get a few more years out of my MBP because other than playing games, it performs amazingly. I guess my next strategy should be to find a friend with a MBP and use his. @Mike, I understand the disappointment. I created a new page with User Map so that we can start showing eGPU.io members who have a Thunderbolt 3 computer that can help. Please check the user map. Strangely, I have half H2D issue with Aorus 1080 gaming box, so I desperately tried updating the firmware for the 1070 one, and it says that I can't update the firmware of one device with another. D0n't know what to check now. I was able to update the firmware on my Aorus 1070 box in Bootcamp on my 15" 2016 Macbook Pro with those drivers. Thanks for the update CheckMate04. It is now saying I cannot install the dell drivers as I have a newer version installed. I'm trying now to find it on device manager now to uninstall it and try again with those dell drivers. Anyone else having trouble now? I want to go back to F1.0, F1.0H2D creates more instability and completely unusable USB ports. I have a feeling this may be resolved by uninstalling the current thunderbolt driver, does anyone know how to do that or had this error before?? Update: You MUST be using thunderbolt 16.2 firmware, the updated one will not send the PD info and therefore not update. If you have update to the new intel version, go to programs and uninstall the latest update and reinstall 16.2. However, after a successful firmware update (non H2D firmware) - I'm still getting 11xx MiB/s in H2D readout on CUDA. I know this wasn't the H2D firmware, but I thought I should still be getting above 15XX or 19XX on the alternate firmware in order to reserve some bandwidth for USB devices? I should add I'm running CUDA while only driving my internal screen - I'm not sure if that's why my H2D is so low? May need to try this on external monitor only setup. I updated to the 1.0 non H2D firmware because I'd like to plug in external hard drive to the Aorus Gaming Box! Any tips/insights? I flashed the H2D firmware and now it shows 22xx MiB/s in CUDA - I didn't think the "other" firmware was such a low limit? I should add I'm only seeing a minor bump in benchmark scores but I think that actual games seem to benefit to a higher degree - but no real data captured to compare. I think the real issue will be if my external HDD really suffers - but considering it's a spinning platter - and caps off around 105 MB/s - I doubt it will really flood the Thunderbolt bandwidth. Now if I plugged an external SSD in, maybe that would really impact things? Glad you got it working. I noticed a significant performance drop with the USB’s with 1.0 H2D. To the point that I couldn’t use a mouse when playing PUBG! Re performance I did some benchmark tests across the two firmwares. See below. So I have tested both firmwares 1.0 & 1.0H2D and would recommend the 1.0 for general usability. The H2D from what I can tell has marginal impact plus you loose all USB functionality other than if you're not doing anything intense. EDIT _ sorry, I missed the captions to your photos - so you are getting in the 15xx MiBs range - so I'm not sure why I only report 11xx MiBs. I've tried the short cable in the box, as well as a long Cable Matters 2M one (which would be reduced bandwidth). I've tried internal screen only, I've tried external screen only - it always reports 11XX MiBs for me.